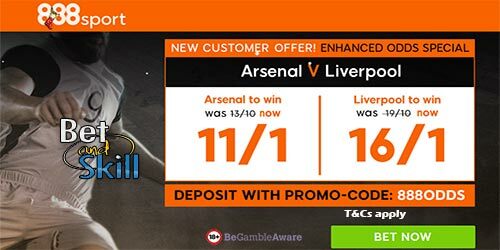 Arsenal and Liverpool face each other in a most anticipated Premier League clash this Friday and 888sport are offering a double price boost on this game! Claim Arsenal to win @ 11/1 or Liverpool to beat the Gunners at 16/1! Max bet £5! In the reverse match, Arsene Wenger's men were hammered 4-0 at Anfield in August. Plus, Arsenal have failed to win any of their last five Premier League meetings with Liverpool. The Reds have won the last three meetings with the Gunners, scoring 11 goals in the process. Join 888sport and choose your price boost - 11/1 Arsenal or 16/1 Liverpool to win the clash! 3. Bet on your favourite team at normal odds in the Arsenal v Liverpool win-draw-win betting market. Max bet £5. 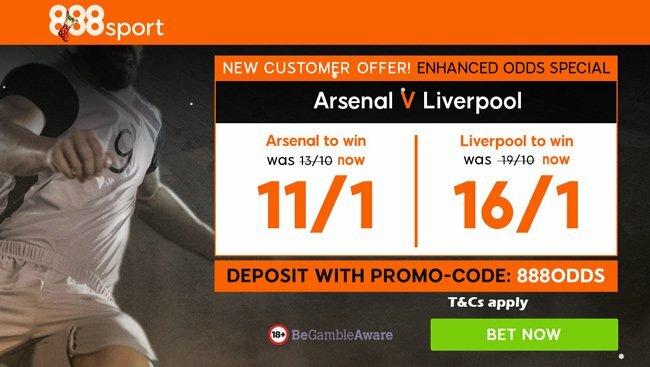 "Claim 11/1 Arsenal or 16/1 Liverpool to win at 888sport (Premier League boosts - 22.12.2017)"